When the oil optimists say that new technology will extend the oil age for at least several more decades, they almost never discuss the limitations of technology, practical or financial. Nor do they like to discuss possible side effects that could render such technology unusable. But the discussion around a new method of heavy oil extraction called toe-to-heel air injection includes mention of both limitations and side effects. For that reason I give the patent holders a much better chance of developing a technique that could make a significant contribution to oil supplies while addressing environmental objections that could doom other methods. 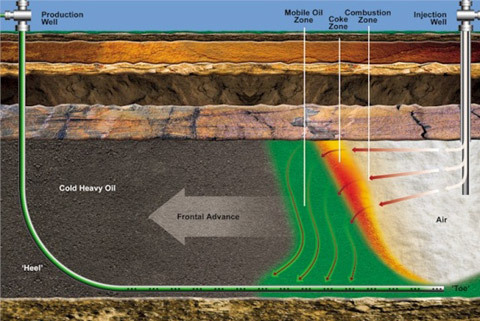 Currently, the energy for extracting oil from underground must come from the fuel and equipment on the surface. But what if the main source of energy for extracting oil could come from the oil deposit itself? And, what if the method for doing this could provide us with access to oil not amenable to conventional extraction techniques while minimizing disruption of the surface and any associated pollution? This is what the developers of an oil recovery technique called toe-to-heel air injection or THAI suggest they are able to accomplish. And, the technique could increase appreciably the percentage of the world's vast heavy oil resources that we are able to exploit. The oil the engineers and scientists at Petrobank, the patent holder, have in mind is so viscous that it is not easily budged from its hiding places below the surface. There are other techniques already in use for extracting this oil. But they typically require copious amounts of both water (usually in the form of steam) and energy to work. The THAI process, however, burns some of the oil in the underground deposit in a way that makes the remaining oil flow to the surface on its own through production wells. This isn't a bonfire, but rather more like a charcoal fire, very hot (400 to 600 degrees C) without flames. Petrobank claims that THAI burns about 10 percent of the oil in place to accomplish its task. The oil is first heated to about 100 degrees C using steam injection. So far this sounds like conventional steam injection technology. But once this critical temperature is reached, the oil is ignited and only air is injected to keep the oil burning. The burning oil creates additional heat which makes the heavy oil flow more easily, and the combustion gases drive the flowing oil toward and up a set of production wells without any pumping. There are other fire flooding techniques. But the particular methods and well configuration of THAI hold great promise for vastly increasing ultimate recovery while minimizing pollution and well failure. Petrobank claims recovery of between 70 and 80 percent of original oil in place, a truly astounding number. Even if this result proves to be reproducible on a large scale, it won't mean that all heavy oil deposits will be amenable to the THAI process. Some deposits might be too scattered to be economical. Others might not be sufficiently saturated to allow adequate burning and thus high enough temperatures. Yet others might be too close to the surface in which case the fire might break through. Finally, geology, remote location and poor associated infrastructure might make many potential deposits financially too risky to exploit. The U. S. Geological Survey (USGS) estimates that some 8.9 trillion barrels of heavy oil and bitumen resources exist on the planet. Some of heavy oil and bitumen is actually already being extracted in the Canadian tar sands, the Orinoco Belt in Venezuela, and places such as the Kern Oil Field in southern California; they are therefore included in current reserves. But if even an additional 10 percent of those resources became extractable through the use of THAI, that would add 700 billion barrels of reserves (assuming an 80 percent recovery rate). That's a significant amount when you consider that the USGS mean estimate for ultimately recoverable oil worldwide is around 3 trillion barrels. The estimates of more pessimistic observers such as Association for the Study of Peak Oil founder Colin Campbell is around 2 trillion barrels. Neither estimate includes deposits such as the Canadian tar sands. Besides its presumed efficiency, the THAI process has several other advantages: 1) a small land footprint, 2) a relatively small need for external water and fuel at startup, 3) the upgrading of the heavy oil into lighter oil while it is in the ground which lowers refining costs, 4) the generation of electricity for site power using combustion gases from the wells for fuel which also means those gases aren't simply vented into the surrounding area, and 5) a very high EROI of about 56 if you don't count the burning of the oil in the deposit (which I don't think we should) or the naphtha used to dilute it for pipeline transport (which is ultimately separated and recycled). The THAI process has yet to be proven on a large scale. And, there may be many unforeseen problems that could limit its usefulness. But based on what I know about other methods, THAI strikes me as a very promising technique for recovering bitumen and heavy oil that might otherwise be left in the ground. Should the THAI process be broadly successful, I still don't think it will shift the world peak in oil production (which I believe is near). But it could serve to cushion significantly any decline and therefore help make the transition to a post-oil society a little less traumatic. last March and came up with an EROI of 56 when the bitumen oxidized to produce hte THAI oil is excluded from the calculation.......see http://netenergy.theoildrum.com/node/5183 .....if you compare THAI EROI to conventional and unconventional production on the net energy graph http://en.wikipedia.org/wiki/File:Net_energy_cliff.gif ,THAI is a game changer. Thanks for correcting my misreading of your data. The thrust of my piece is, of course, that if THAI can succeed on a broad scale, it would significantly affect the future of the oil business. An EROI of 56 instead of the 8 that I cited would make this even more the case. But, of course, we must see how it performs when scaled up. Extend the oil age? Promote more economic growth, and also population growth, in order to discharge further heat into the Earth's fragile biosphere? Like those fools who claimed that nuclear energy would be too cheap to meter, the author indulges in a little too much techno-fix $cience and not enough common sense and prescience. Wake the ph*@k up! Extending the oil age is like giving a violent crack addict more drrrugs... and then hire him to baby sit your children while you go cruising off to Wal Mart to buy sugar pop diabetes water and junk $nacks for boobtube footballing. No doubt... somebody here is not getting the message! The looming global catastrophe destroying the Gulf of Mexico (and beyond) with crude oil leaking from a wound in the Earth's crust one mile beneath the sea, a terrible mortal wound causing an Exxon-Valdez crude oil spill EVERY 3-4 DAYS, suggests the Doctrine of Perpetual Consumption of finite resources in a closed looped system (the Earth) is the road to extinction. Yesss... we are clever baboonies, but we are not wise. I cast my eyes across the historical horizon and see that the Titanic is sinking off the coast of Easter Island. In 100 earth years... the United $tates of Perpetual War Profiteering will NOT exist. Much of humanity will also be gone... because WHERE IS NO INSIGHT, THE PEOPLE PERISH! Enough said! And you (thinking too much like ewe) deserve this righteous criticism.